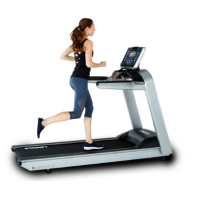 Landice built its reputation on the quality and craftsmanship of its treadmills. Since 1967, we have continuously engineered the most innovative and durable fitness products in the industry, here in the USA. The Pro Sports Control Panel combines a versatile liquid crystal display (LCD) with a variety of program options, numeric keypad for quick data entry and a contact heart-rate monitor. These features offer an exciting and fun workout so you can reach your fitness goals. The L9 Club treadmill features a four-horsepower continuous-duty drive motor ranging in speed from 0.5 to 11.0 mph. The rust-free aluminum frame contains a 1-inch thick reversible deck capable of reaching a 15% elevation.